“Stopping climate change and educating the youth are the two risks that Africa should focus on mitigating”, exclaimed Esther Agbarakwe during an interview with Edzai Zvobwo, host of The Education Support Forum’s Human Development Podcast. Esther was being interviewed as she is part of the inaugural African leg of the Goalkeepers event to be held in Johannesburg on the 1st of December 2018. 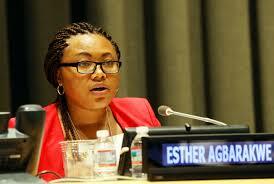 Lets listen to what Esther had to say about climate change. Edzai Conilias Zvobwo is passionate about empowering Africans through mathematics, problem-solving techniques and media. As such, he founded MathsGee. Through this organisation, he has helped create an ecosystem for disseminating information, training, and supporting STEM education to all African people. A maths evangelist who teaches mathematical thinking as a life skill, Edzai’s quest has seen him being named the SABC Ambassador for STEM; he has been invited to address Fortune 500 C-suite executives at the Mobile 360 North America; was nominated to represent Southern Africa at the inaugural United Nations Youth Skills Day in New York; was invited to be a contributor to the World Bank Group Youth Summit in 2016; has won the 2014 SADC Protocol on Gender and Development award for his contribution to women’s empowerment in education; and has partnered with local and global firms in STEM interventions.